We’d love your help. 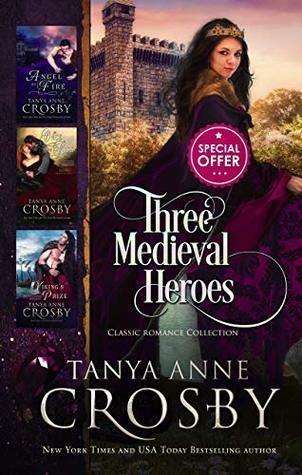 Let us know what’s wrong with this preview of Three Medieval Heroes by Tanya Anne Crosby. From the embattled Duchy of Normandy, to the anarchy of King Stephen's reign and the perilous fjords of Norway, discover three full-length classical romance gems for a limited time at a very special celebratory savings, from New York Times Bestselling Author Tanya Anne Crosby. Devastated by the death of her father, Norman noblewoman Chrestien de Lontaine vows t From the embattled Duchy of Normandy, to the anarchy of King Stephen's reign and the perilous fjords of Norway, discover three full-length classical romance gems for a limited time at a very special celebratory savings, from New York Times Bestselling Author Tanya Anne Crosby. Devastated by the death of her father, Norman noblewoman Chrestien de Lontaine vows to see her twin sister wed and then take refuge in a nunnery... but the Silver Wolf has come knocking on their door and treachery is at hand. To settle a feud, Dominique Beauchamp is prepared to sacrifice her freedom in order to heal their ravaged lands. Offered in marriage by her brother to the lord of Drakewich, she arrives to take the d'Lucy name ... never counting on losing her heart to the brother of her betrothed--the notorious Black Dragon. To ask other readers questions about Three Medieval Heroes, please sign up. Tanya Anne Crosby is the New York Times and USA Today bestselling author of thirty novels. She has been featured in magazines, such as People, Romantic Times and Publisher’s Weekly, and her books have been translated into eight languages. Her first novel was published in 1992 by Avon Books, where Tanya was hailed as “one of Avon’s fastest rising stars.” Her fourth book was chosen to launch the com Tanya Anne Crosby is the New York Times and USA Today bestselling author of thirty novels. She has been featured in magazines, such as People, Romantic Times and Publisher’s Weekly, and her books have been translated into eight languages. Her first novel was published in 1992 by Avon Books, where Tanya was hailed as “one of Avon’s fastest rising stars.” Her fourth book was chosen to launch the company’s Avon Romantic Treasure imprint.